The Sallie Harrison Chapter supports the community by participating in patriotic programs, local parades and celebrations. Chapter members contribute to important service projects, support schools and sponsor essay contests, just to mention just a few activities. DAR involvement is what you make of it. 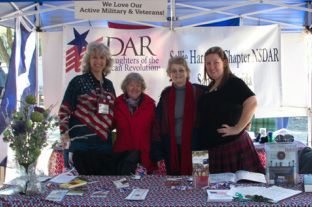 Members can spend as much time participating in DAR as desired; DAR is meaningful to its members throughout our lives. Kids In Support of Soldiers Inc. is a non-profit organization created with the desire to take care of the men and women of the armed forces. K.I.S.S. was founded in April 2009 by four children who wanted to make a difference in the soldiers' lives who are protecting our freedom, no matter what branch of service they are in or what state they are from. This organization was selected as the 2015 National Project of the Helen Pouch Memorial Fund. The National Society of the Children of the American Revolution (C.A.R. ), founded in 1895, is the oldest patriotic youth (under the age of 21) organization in our country. The Sallie Harrison Chapter sponsors the Fort Mellon Society, Children of the American Revolution. For more information about this outreach, please contact us. Each year, the Sallie Harrison Chapter participates in the Scottish Highland Games. During the Games, chapter members reach out to the community members during the two-day event. We spend the weekend celebrating our military and helping those find out if their Scottish ancestor fought in the American Revolution. Members of the Sallie Harrison Chapter manning the tent during the games.